The month of June is dedicated to the Sacred Heart of Jesus The Solemnity of the Sacred Heart of Jesus is celebrated 19 days after Pentecost. The Feast of the Sacred Heart in 2018 will be on June 8, 2018. Jesus heart is the source of Divine love therefore, a devotion arose to increase love for Jesus through prayers. Devotion to the Sacred Heart of Jesus has been evident for many centuries under different forms. However, Margaret Mary Alacoque (1647-1690), a Visitation Nun of the monastery of Paray-le-Monial, France received visions of the Sacred Heart and spread its devotion with this feast. Jesus appeared asking for a devotion of expiatory love and frequent Communion, Communion on the First Friday of the month, and the observance of the Holy Hour. In 1856, Pope Pius IX extended the feast of the Sacred Heart to the universal Church. On 11 June, 1899, by order of Pope Leo XIII, all peoples were solemnly consecrated to the Sacred Heart. It is annually celebrated on the Friday 19 days after Pentecost. 1. I will give them graces necessary for their state in life. Lord Jesus Christ, we consecrate ourselves to You today, each one of us, and all of us together as a family. Your Sacred Heart, the heart of your crucified and risen Body, is the ever living source of mercy and grace, hope and love for all of us. We desire to pledge ourselves and our lives to You in return. Teach us to be always united with You, through Your Holy Spirit in mind and heart, in all our thoughts, words, deeds, joy and sufferings. Grant that we may ever know You more clearly, love You more dearly, and follow You more nearly. We wish to share in Your redeeming work in our world: that your Father's will may truly be done on earth as it is in heaven, that the civilization of justice and love may thus be built up in our land. 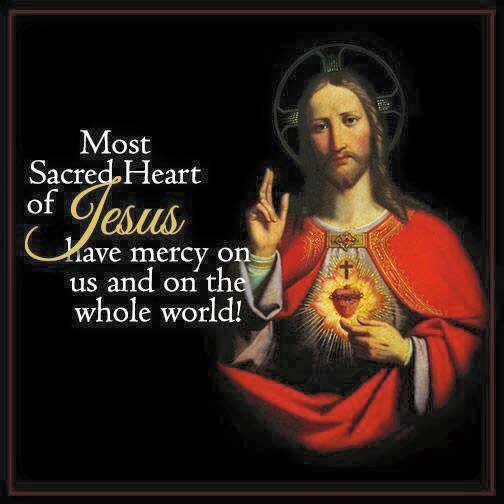 Heart of Jesus, help us to keep sin away from our lives. Help us to keep loving, serving and forgiving each other. Live in our hearts and in our homes always, Make us wholly Yours. With Your Mother's Immaculate Heart, we renew our consecration to Your Sacred Heart, for the ever greater glory of the Father in Heaven, Amen. Jesus, Mary and Joseph, be with us and bless us now and at the hour of our death, Amen. In 1899 Pope Leo XIII approved this Litany of the Sacred Heart of Jesus for public use.